Many state constitutions explicitly require districts to respect communities of interest, and in others, redistricting authorities may state that they intended to respect communities even if they are not required by law. The community map feature permits the public to define their communities on a map, so that redistricting authorities can consider them in their mapping process. A community map can be used in conjunction with the Map Layers tool to show the community while you are drawing a redistricting plan, and with the Show Splits and Generate Splits Report tools to show when districts split communities or group various communities into a district. The community map feature can be used for other purposes. For example, a "community" could be the census blocks associated with incumbents' homes. When these homes are identified as a community map layer, the Generate Splits Report tool can be used to show when two or more incumbents are placed in the same district. If the party affiliation of the incumbents are noted, the report will show if one party's incumbents are disproportionately grouped into the same district. The community map feature shares much of the same look and feel as the interface for drawing a redistricting plan. However, some important differences are described here. 1. Use a Select Tool to select the geography you wish to assign to your community. 2. 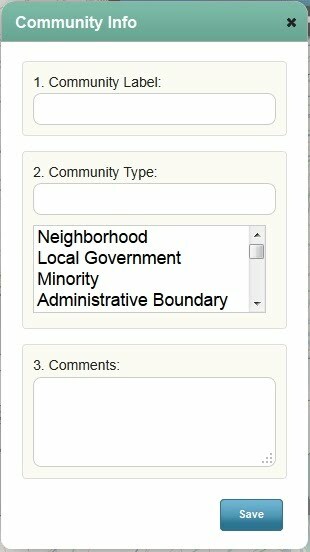 In the Assign to Community pull down, select "New Community". Community Label: A name for the community. Community Type: Community types are used to determine when districts split or combine communities of similar or different types. The administrator may provided some suggested default types, but you are free to enter your own type. When you do, it will become available as an available community type so that you can easily recall the name you assigned to the type. 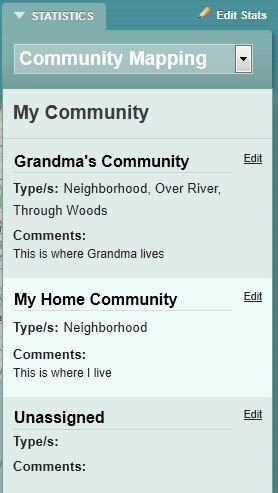 You can provide up to three different types to a community by separating the type names with a comma. Remember, types are useful for determining how similar or dissimilar communities are split or grouped. This information will not be particularly meaningful if each community is assigned a unique type. Comment: Any additional text you may wish to add about the community. Click "Save" and your community will be added. You can add more communities my repeating these steps. You can use the Select and Assign map editing tools to edit communities, just as you would districts. Once you have created a community, the information about it and others you have drawn will be presented in the statistics sidebar to the right of the mapping area. You can view statistics for your communities, such as racial and political characteristics, by using the pull down tab at the top of the statistics sidebar on the right hand side of the mapping area. You can edit statistics to choose your own statistics to display among those the administrator has made available.